Dots Dots Dots! 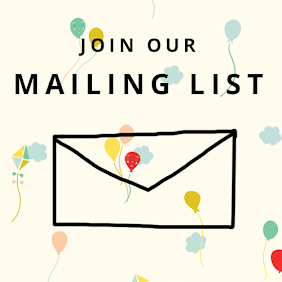 Enter to win a sampler bundle from Momo! Guess what time it is? 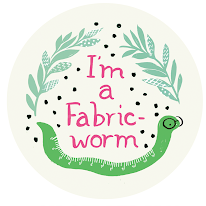 It's time for another Fabricworm Giveaway! 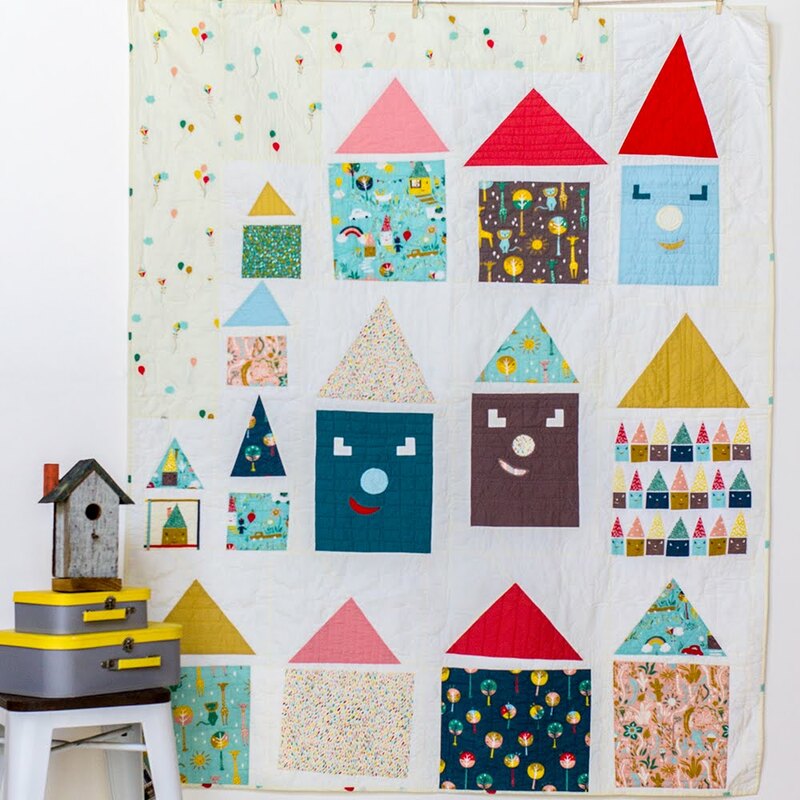 This week we're giving away a fat quarter bundle of Momo's Linen Mochi Dot Sampler! Use the Rafflecopter widget below to enter the giveaway. This giveaway ends on Monday 3/17 @ 9am PST. The winner will be contacted shortly after by email. The winner will be chosen by random.org through Rafflecopter. This would make for a fun quiet color book for my son! So cute! I can think of so many ways to use this! I would make some new clutches for my Etsy shop! Oh these are so bright and FUN!! 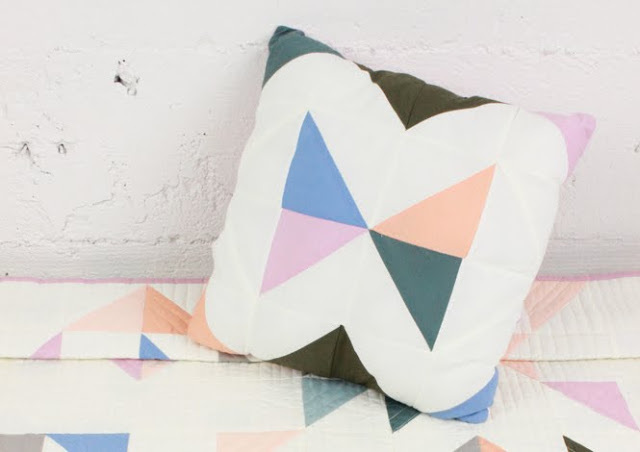 I would love to make some fun decorative pillows--brighten up the room! I would probably pair it with a fun kid's print to make a quilt. Polka dots are my favorite! Use it towards a TP project for my toddler. Instead of Dotted Swiss, my brother used to call it Swiss Army Dots. "nuf said." make something cute for my new baby granddaughter! Make is rainbow skirt for my daughter! These bright dot fabrics would be centre crosses with low volume backgrounds in a bed-sized quilt. These would make some pretty baby quilts. Love! I'd make a twirly skirt for my girls! I'd make my daughter some pillow case dresses. She loves dots! Enjoyed shopping (and buying) at your store last week. 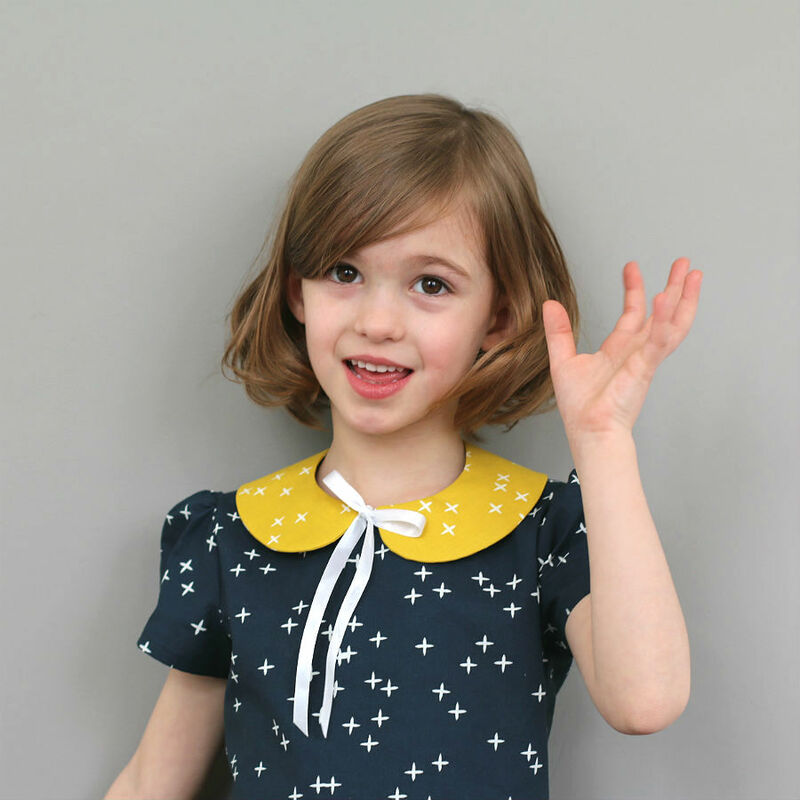 I would love use for applique for granddaughters summer dresses.. 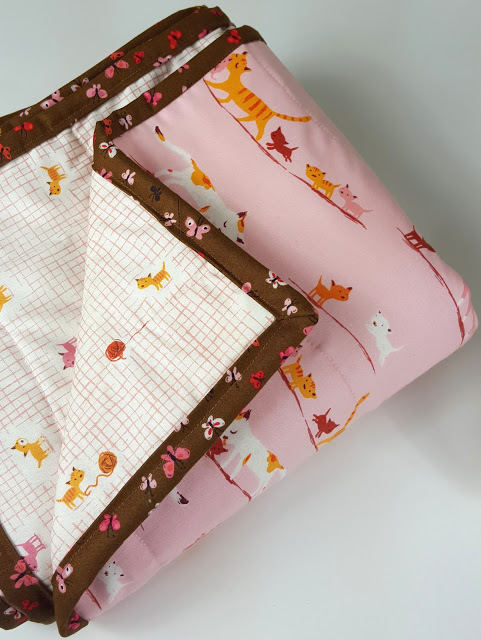 I would have a blanket made for my daughter and matching burp rags with any leftover fabric. Cute Easter bunnies for the kids at the hospital. Oh such loveliness!!! I would love to make a quilt for me soon coming grandbaby. Thanks! Perfect for so many projects! I think I would have to make an awesome skirt for my daughter. I love making doll cloths. Thank you for a wonderful give away!! I don't have any dots in my fabric stash. In fact, I'm just now building it and I need these! So Cute! Love the bright colors! These would be great additions to a quilt. 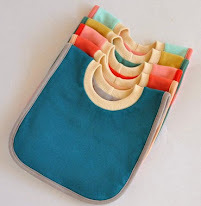 Would be so great for some bibs! Love the polka dots, just used some other to finish a baby quilt. Could use them for another baby quilt. Thanks for the giveaway. 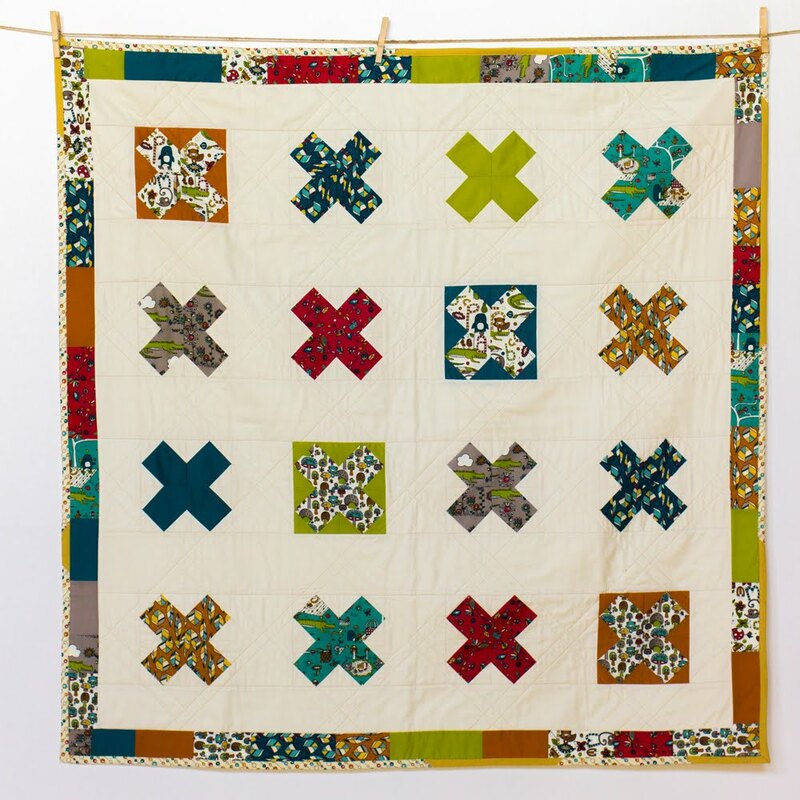 I've always loved the spool quilt block pattern, but never made one. I think these would make a wonderfully cheerful spool quilt! I love polka dots. I would love to add these to my stash! I think I would use different colors in different quilts .. spread the dots around! 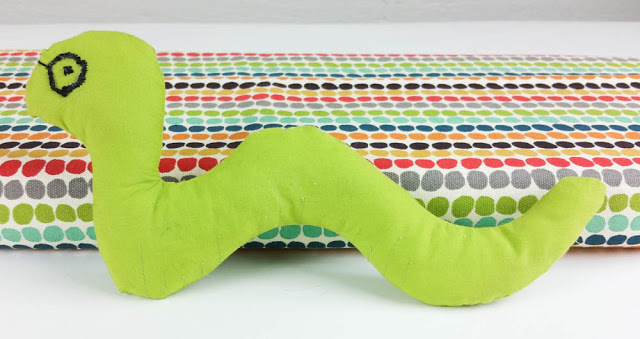 I would use the Dots Dots Dots to make quilts or accessories for babies. would be lovely in a quilt!! I'm so ready for Spring; I'm seeing curves and vague flower shapes. I would use them as blenders in multiple quilts! I'd love to make some kind of star baby quilt with the dots! How cute would that be? thanks for the chance ~ fingers crossed! I love the dots! I'd use them in quilts. I would make a bag. Thanks for the chance! Love!!! I think I would make a cute twirly skirt for my niece. I'd start my second ever quilt with this - like a rainbow look I think - at least thats what I see in my head for these! I'd probably use these for some reusable snack bags I've been wanting to make. Ooh! I'd make some rainbow totes with this!!! thx!!! I might use them for a dresden quilt! Thanks! So cute! I would make zipper bags and bows. Wow I can see this in a quilt for grand daughter or just about anything!! 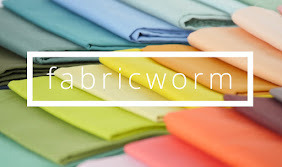 I've been wanting some rainbow fabrics for my stash. Would LOVE to make a Dresden plate with it! I love to make little girl outfits! Thank you! I would make a ruffly little skirt for my granddaughter! I would pet it for awhile and then decide what to make with it. My grandmother loved dots so probably something she would have liked back then like an apron. I can think of a lot of things I could do with this. Beautiful fabric! I would make a lovely baby quilt. 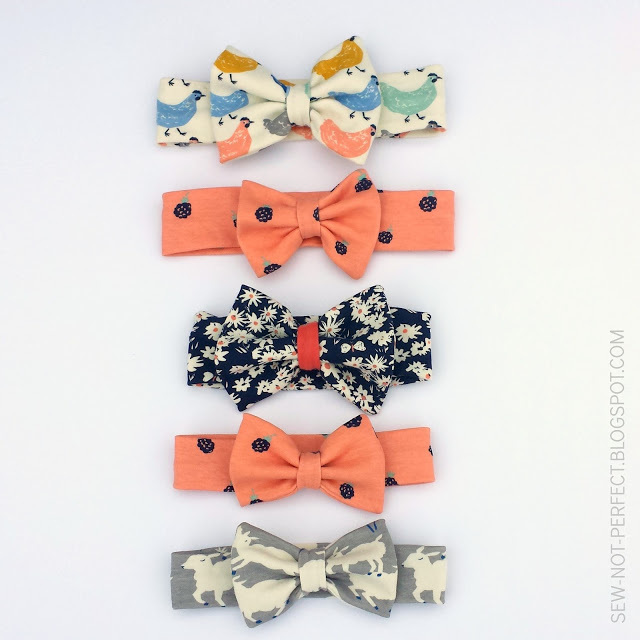 Perfect for cute little head scarf/ties. I've never worked with linen. Could make a cute bag! Make a banner for my new baby! These would look great in a spring applique design! I would make a quilt, of course! 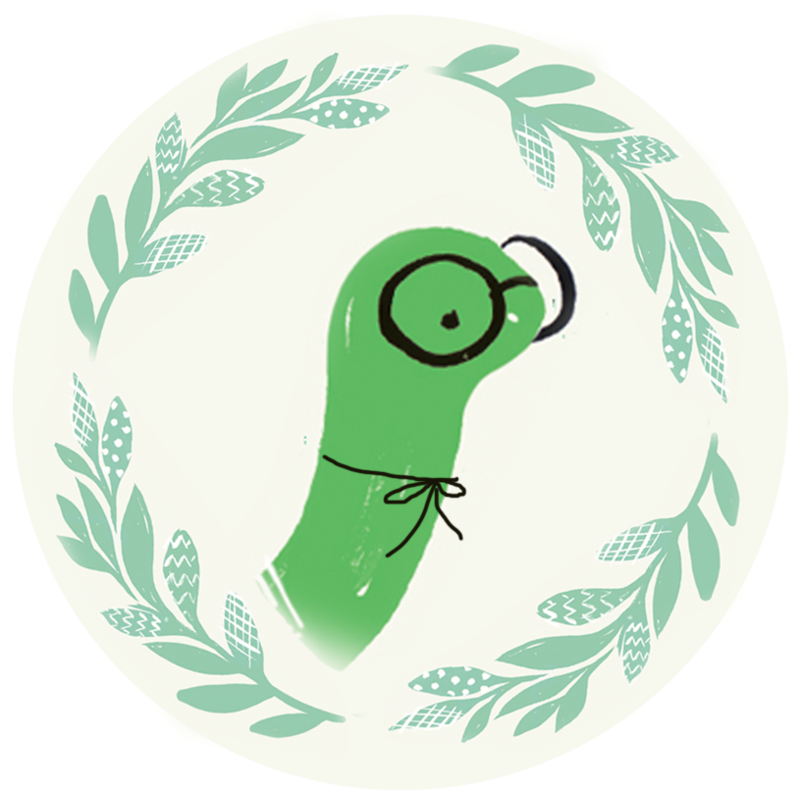 This would be awesome for tote bags and aprons! I would love to make little dresses and skirts for the little girls in our family! My daughter is teaching herself to sew little outfits! Love Love Love. So many things could be made out of this! I was out with my 4 year old granddaughter and she said "Mimi I need some polka dot shorts", so if I'm blessed, that little girl will have polka dot shorts! I've been wanting some of these luscious dots, and would make something fun for my table! Thanks for the chance. I would add it to my stash and make an amazing lap quilt with them. I would make a cute skirt for my DD. Would be perfect for spring weather. More than likely I would make a lap quilt but I might make a ruffled bag for myself. love dots! I'd use it for some cute pouches. I would make a rainbow quilt! I'd make a crib quilt for my baby due next month! I´ve been daydreaming about rainbow polkadot linen dress for my DD...how did you know? I want to make it! These would make a fantastic Easter Wall Hanging! I would make my rainbow a rainbow quilt! 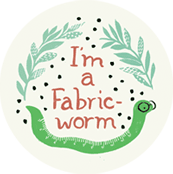 I'd use it to make a fabric banner for my niece's rainbow bday party! I adore the fabrics! They would be fun to work with. I'm thinking a throw to cuddle under for movie nights. I think I'd have to make a rainbow quilt with that! Add them to my few stashes of dots and make a dotty quilt! Ruffles on strip shirts! Thank you! 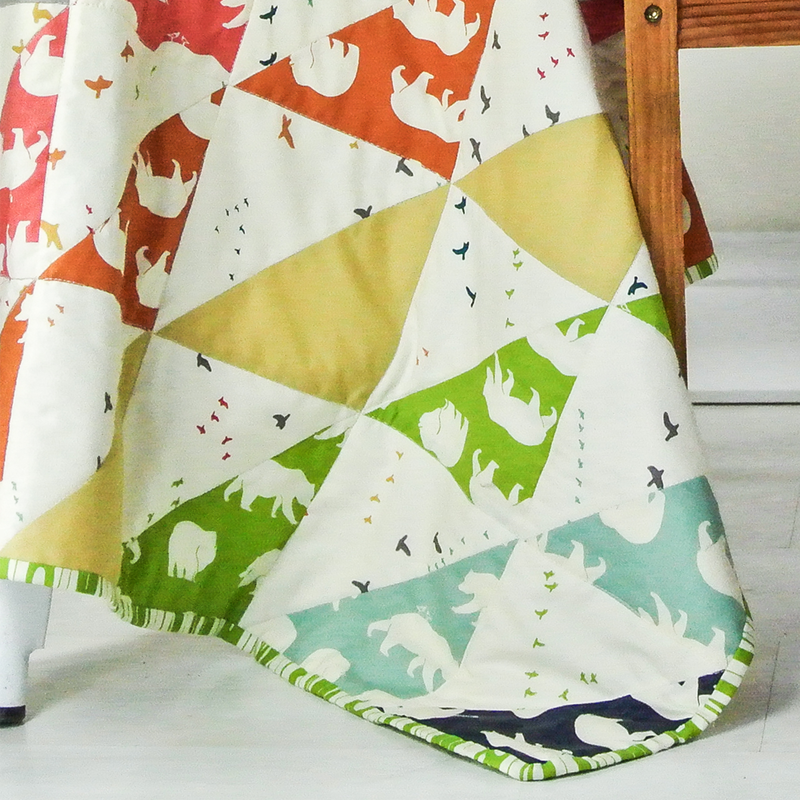 A patchwork quilt skirt for my daughter - such cute fabrics! 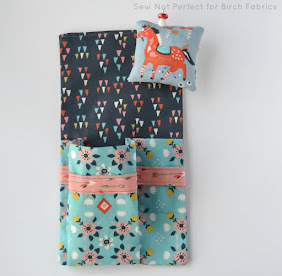 I'd sew a baby quilt! I just finished my 1st ever quilt for my son. Now my other 2 kids want one, so I would add it to those. These colors are telling me I must make crayon totes for my grandkids with them. I could easily use every bit because I sew for children & I'm always wanting a dot print to match a fabric when I sew something. 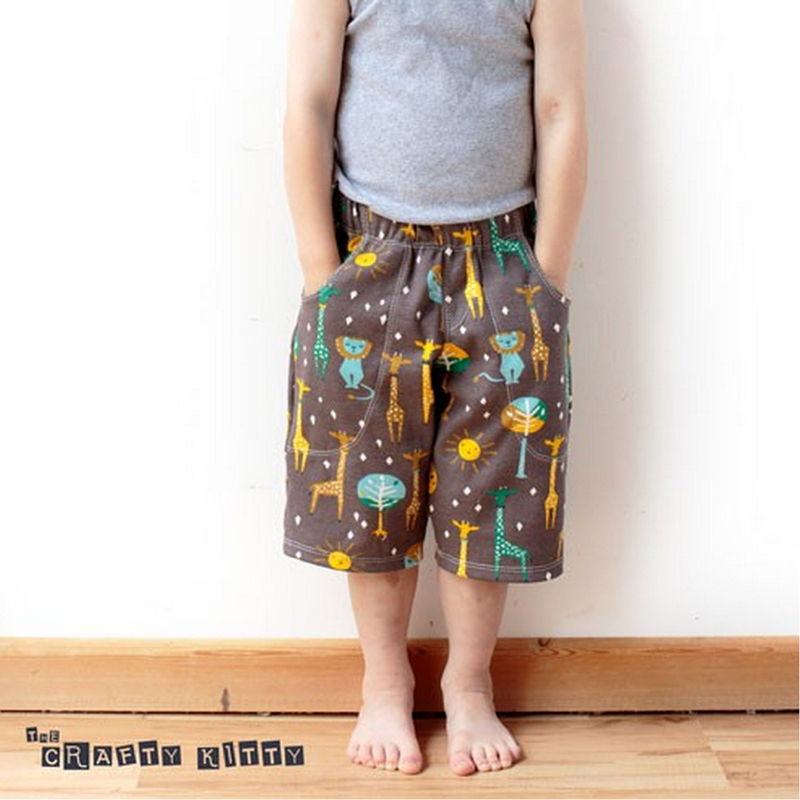 So bright and beautiful, would be perfect for my toddler! These fabrics would be perfect in my economy blocks. So many choices. What would I make? Oh, I love the idea of a rainbow dress or a quilt with rainbow circles. It would either be potholders or end up in a quilt. this would make a great rainbow quilt for my son's bed! I would make a quilt - love this dfot fabric!!! Perfect for a retro look! 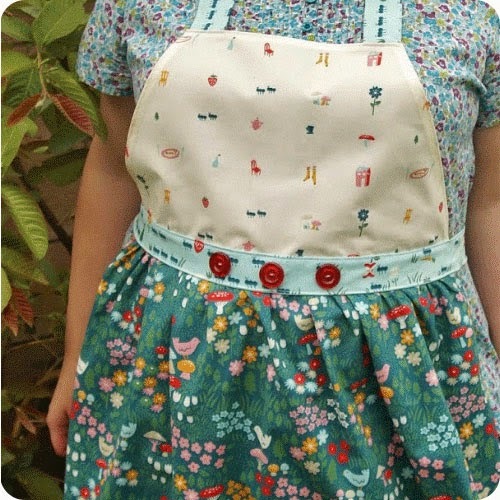 Dresses, buntings, aprons, ahhh...the possiblilities! I love pokadots on my bindings. 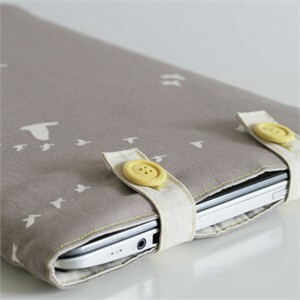 I would make pouches, or a clutch, or pencil cases, or ... Love them! I would make pillows for my sofa. I would make a cute baby blanket!! I would use them for a sampler quilt or a BOM quilt. They are so cute! Love the dots! I'd love to make the fat quarters big tote bag I've had my eye on, with lots of pockets! I think it would make cute pillows. We will be moving to our new Army post in Germany next month and I will need to have some pops of color. Awesome quilting fabric with those dots! I have seen quite a few quilts made with polka dot fabric. 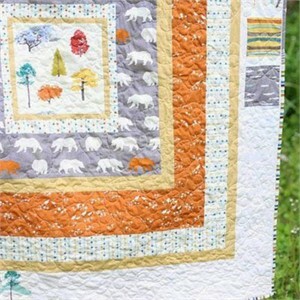 I would love to make one, I have a few scraps of polka dot fabric and I would put them together and make a great quilt.. I would like to use them in a rainbow quilt. 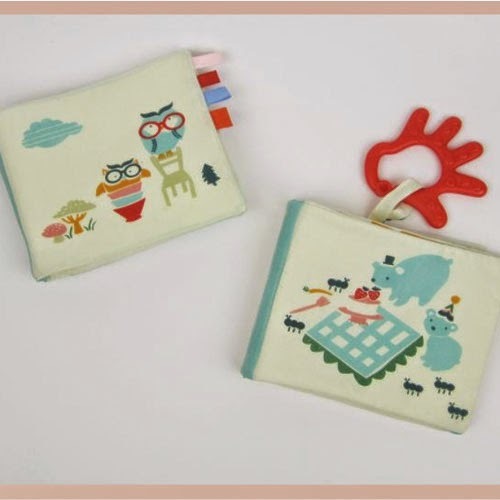 I would make some adorable matching bibs and burp cloths. I would make some bibs! Awesome! I will most likely use them in a quilt... or perhaps a bag... or Maybe a Yoga mat carrier! great giveaway! looks like a quilt to me! 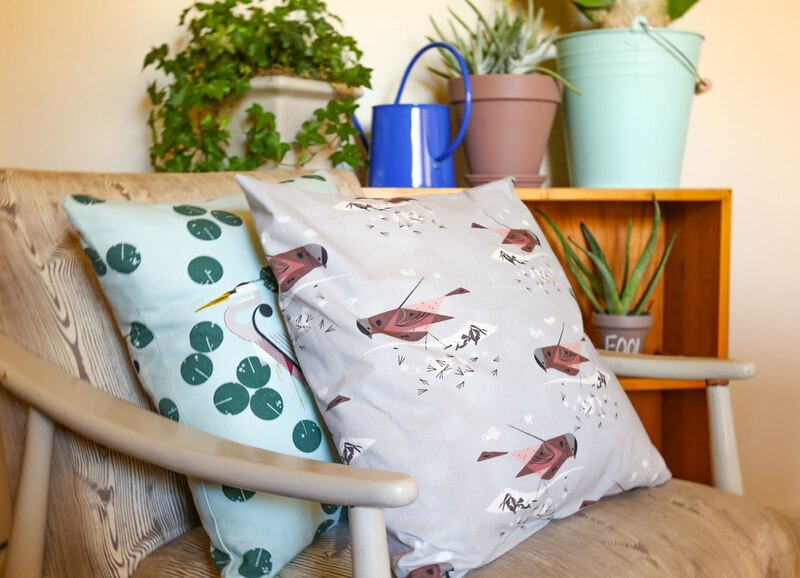 I'm in pillow making mode, so I'm sure I'll come up with some kind of pattern for a pillow to use them in!! I think I would make myself a tote of some kind, I love dots! I love the colors! I could see these as a rainbow baby quilt. I would use it in fabric baskets. I would probably make rainbow strip skirts for my daughter and nieces. 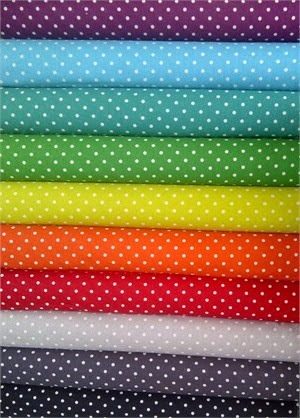 I am looking for fabrics to make baby quilts, and these dots are perfect! Add it to the stash fabric I'm trying to start! Thanks for the opportunity! I would make a modern Grandmother's Flower Garden Quilt. Rainbow dress for my daughter! I love dots! A purse to match my daughter's Minnie dress! I have a rainbow quilt in mind for this bundle of goodness. Thanks for the giveaway! They'd be a great addition to the traveling quilt I'm starting or fun pillows for my kids room! I'd use it for lining purses. First I would make a napkin out of each color. then i would use the remaining pieces in a table runner. I'd use them in bag & wallet making... either as patchwork pieces or lining & pocket pieces. 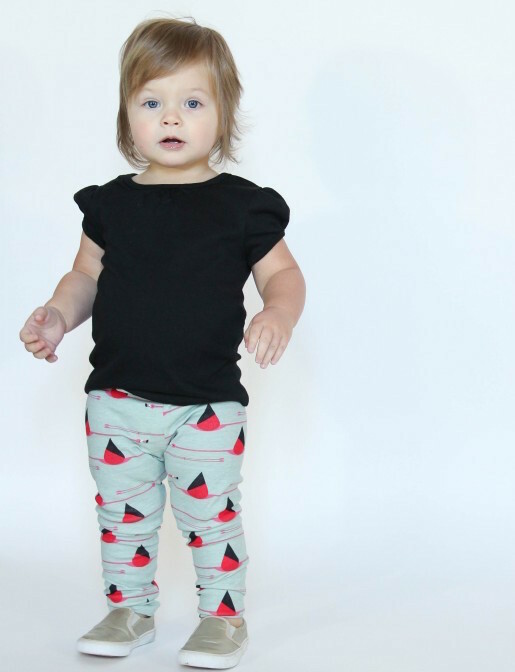 Darling Skater Pants For Your Little One!